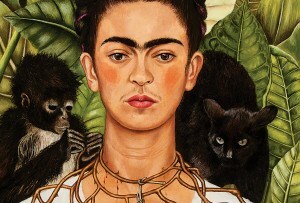 One South Shore native continues a great American art form. 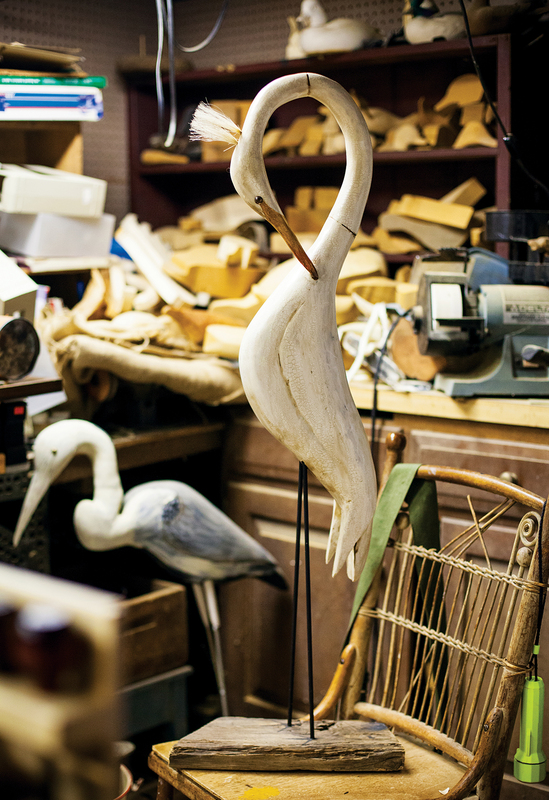 By Lindsay Tucker·	 3/4/2014, 4:52 a.m.
Next to jazz and scrimshaw, decoy making is one of the few traditionally American art forms, and very much a part of the New England heritage. 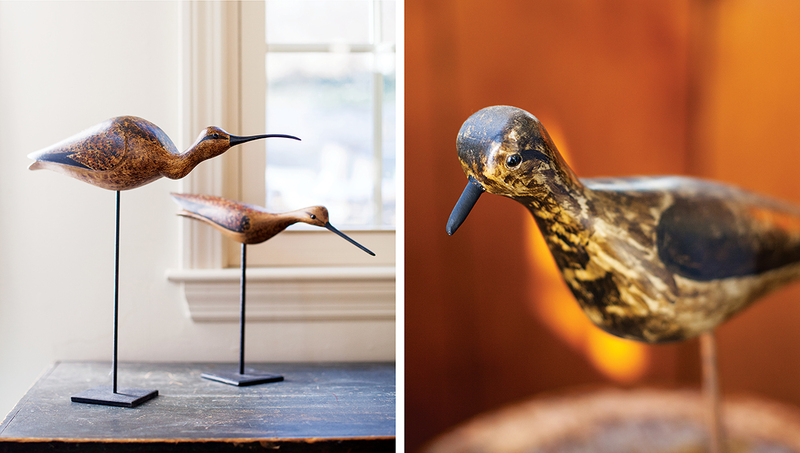 Exquisite handmade black ducks, geese, and bluebills—created in the early 20th century by famed Massachusetts carvers like Joseph Lincoln and Elmer Crowell—can now fetch more than $1 million each at auction. 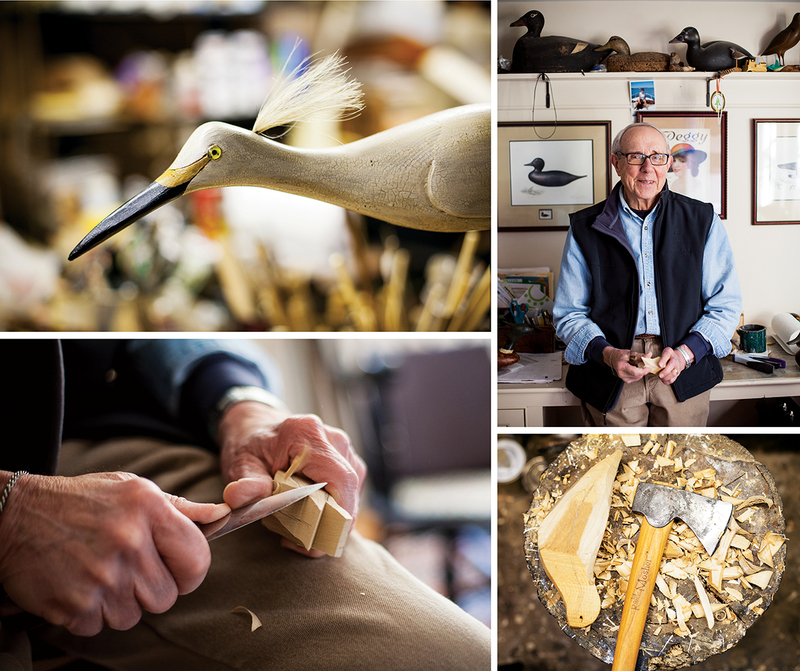 It was the beauty of these locally crafted birds, as well as time spent hunting with his father as a young boy, that influenced Hingham Harbor Decoys’ Bob Mosher to begin carving his own ducks and shorebirds more than 60 years ago. The now-retired executive is mostly self-taught, although he’s taken a few classes over the years with other East Coast carvers. “We tend to learn from each other,” he says. Mosher is highly accomplished in his own right; in 2009, his work won first place in the Ward World Championship Wildfowl Carving Competition, the same year he was the “featured carver” at the Thornton W. Burgess Society Bird Carving Show in East Sandwich. 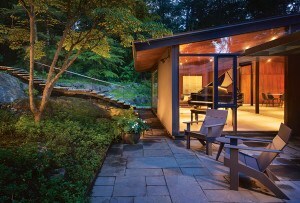 All of Mosher’s creations—from tiny chickadees to majestic full-size swans—start out as blocks of northern white cedar from Lee, Maine, near the Canadian border. 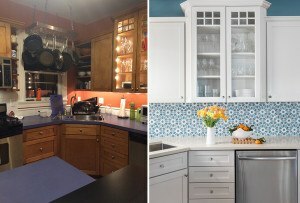 In the basement workshop of his 1830s home, the artist uses a band saw to cut out a block, then “knocks it down” with a hatchet or big draw knife until it’s roughly the shape of the bird. He attaches heads (made of pine) with dowels, refining the assemblage for a few minutes with either a bow sander or a power sander (if the bird is quite large) until it’s ready for paint. Although Mosher tends to make whatever he’s interested in at the moment, shorebirds like sanderlings and sandpipers are in great demand among “people who like the outdoors, from bird watchers to duck hunters,” he says. 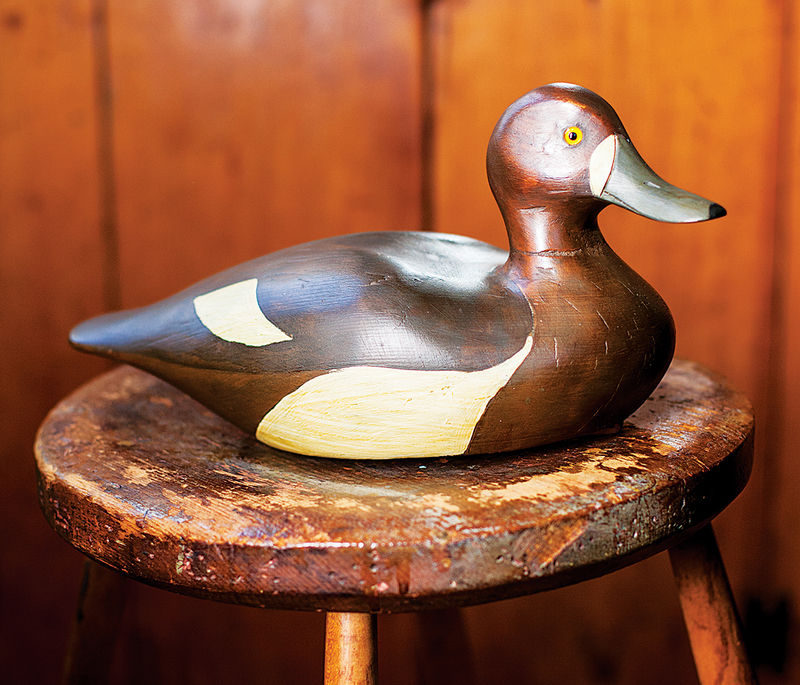 On shelves, above doorways, and resting on tabletops are decoys of all kinds, some of his own that were gifts for his wife, Peggy, and others he’s collected at antiques shows and auctions. Peggy, he says, was “a very good pick,” and is, perhaps, his harshest critic. “She kids about the fact that when she married me, she thought all ducks were mallards,” but at this point, he says, “she’s a pro” at identifying the 20 or so species of waterfowl he so carefully prepares for sale at Hingham’s Artisans in the Square and the Historical Society gift shop. 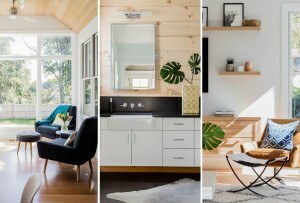 Clockwise from top left, a snowy egret with a horsehair-bristle crest; the artwork in his workspace pays tribute to his life’s loves: decoy making and his wife, Peggy; Mosher traded a large batch of cedar for this customized hatchet; Mosher carves the bird bodies by hand. A great egret and a great blue heron in the workshop. 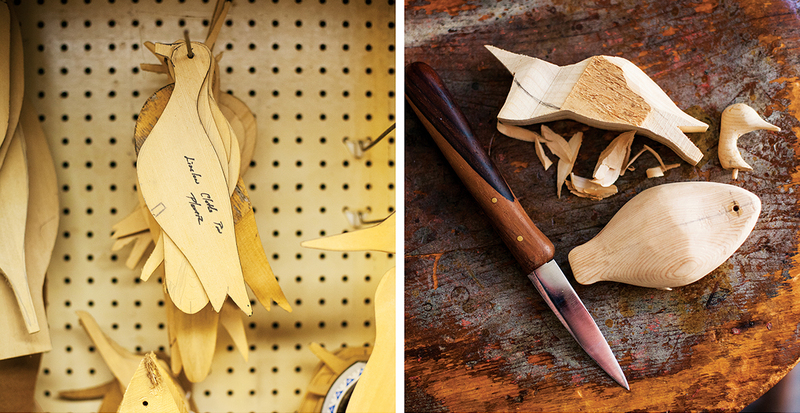 From left, Mosher uses templates to lay out each decoy on the cedar; the decoy maker says he loves his “magic knife,” a gift from the esteemed carver Mark McNair, because it fits perfectly in his hand. From left, two of Mosher’s favorite pieces, an Eskimo curlew and a Cape Cod yellowlegs, sit on display in his living room; an antique-style Golden Plover shorebird. From top, Mosher’s drake red-breasted merganser is one of his more popular pieces; the Hingham Harbor Decoys sign stands in reverence of the famed carver Elmer Crowell, whose sign read A. E. Crowell & Son.